I've just introduced LEGO Mindstorms EV3 to my 7 and 8 (nearly 9) year olds and I wish I'd done it earlier. 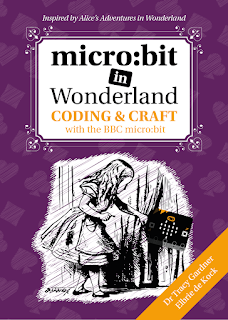 Mindstorms is fantastic, but it's recommended for children aged 10+ so I had planned on waiting a while before getting my younger kids started with it. That turned out to be a bit of a mistake. Not a major one, they will still get loads out of it and there are definitely plenty of things that you can do with EV3 that my kids aren't ready for yet. But I like to get the most value possible from any piece of technology so the longer it can be used for the better! 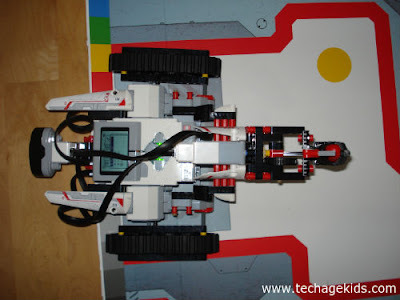 LEGO Mindstorms isn't cheap so value for money is especially important. If you've got older kids, don't worry, you haven't left it too late - there's plenty of stuff you can do with EV3 that would challenge adults. But if you've got tech-savvy younger kids then I'd definitely recommend starting earlier than 10. This was the first aha moment - you don't need to be building the more complex models to get a lot from Mindstorms. 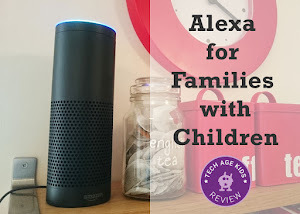 A parent could even build a robot for their younger child and then let them use the drag and drop software or the remote control app. 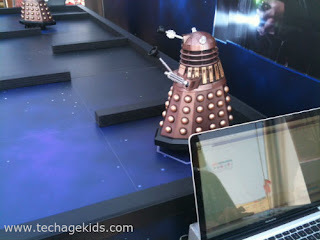 Then we attended the fantastic BBC Make it Digital Roadshow where my kids got to program Daleks! They quickly recognised the software from their earlier experience and we could see that the Daleks were really toy Daleks mounted on LEGO Mindstorms robots! The children had to program the Daleks to move through a maze. My 7 year old spent ages doing this (he had a robot to himself this time so didn't have to compete with his brother.) He took to the programming immediately, though it did use simplified blocks. He soon had a Dalek not only navigating to the centre of the maze but reversing his journey and returning to the starting point. The lovely helpers then set him the challenge of going right across the maze which he also completed. OK then. My kids are ready for LEGO Mindstorms. I'm not suggesting that all 7 year olds would grasp the software. 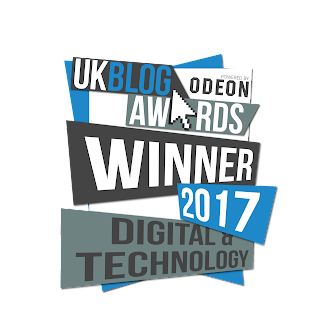 My son has used BeeBots, ProBots, BigTrak, Code.org and lots of other similar technologies and he does love coding. But there are loads of kids out there who are in a similar position. So we got LEGO Mindstorms out. My 8 year old is the LEGO instruction follower in the family so he built the TRACK3R treaded vehicle that is included in the instruction booklet in the box. This wasn't a long difficult LEGO build at all and he whizzed through it. I was relegated to piece sorter-outer. We quickly moved on to programming. 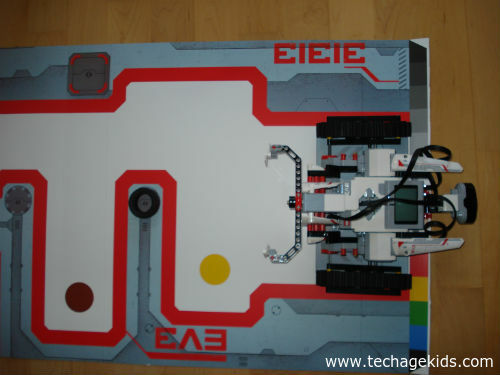 The LEGO Mindstorms box has an outer layer which turns into a mission mat which you place the robot on - nice feature. You then use the LEGO Mindstorms software to work through a series of missions for the robot, some of which use the mat. Each mission has a set of built-in instructions to follow which may include building extra LEGO accessories for the robot. My kids sailed through the missions having great fun. The (software) blocks are a bit fiddly to work with, but my kids managed it. There are missions for 5 robots. After the first robot which is built from the included instruction booklet, there are on-screen instructions for the other robots. This works brilliantly and means the instructions are always accessible. The missions have a range of difficulties so some can be left for later when your kids are ready. My kids were able to independently work through the early missions. They are keen to make some of the other robots but they don't want to break TRACK3R apart yet. It has been put into service as transport for various LEGO figures. It's really nice to have when my kids are still young enough to actually play with their LEGO. 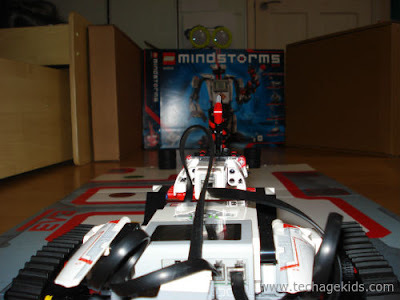 I can see LEGO Mindstorms EV3 being one of our toys that gets returned to again and again. If you're going to have a Mindstorms set for several years and bring it out regularly as your children are capable of more then you'll need to think about storage. If your LEGO collection is as large as ours then you definitely don't want the Mindstorms pieces being absorbed into it. The cardboard box that LEGO Mindstorms EV3 comes in could be used for long term storage if you always take the robots apart, but my kids never want to do that. We've given EV3 a drawer of his own in our 'robot table'. I don't want to stop my kids playing with TRACK3R or other robots they build but I want to make sure we keep the pieces up together. TRACK3R can come out to play but he has to go back in his drawer at the end of the day! So what age is LEGO Mindstorms EV3 suitable for? As with all things, it depends on the child. Many children are learning to code at school or in code clubs and there are lots of kids who happily build LEGO sets recommended for older children. They need to be competent LEGO builders who have the skill and patience to put together a moderately complex model so I'd recommend they have some practice with LEGO Technic sets first. It would be a good idea if they have done some coding first. See our list of websites for children to learn to code if they need some practice. The missions do a great job of teaching kids how Mindstorms works so if children have the pre-req skills they should be able to get a lot from EV3 independently. If parents are willing to work with a child then there's less need for them to have all the skills. 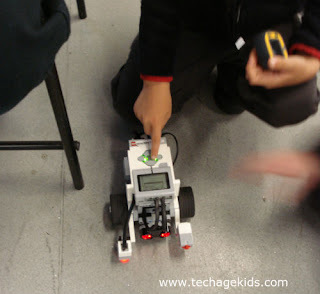 We'll be writing more about our LEGO Mindstorms EV3 projects in future so check back. 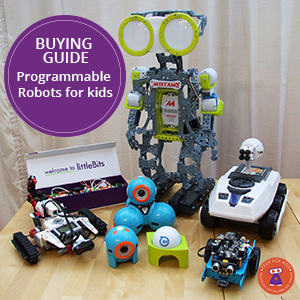 I'm thinking of getting Mindstorms for a younger child and this was exactly the sort of information I was looking for - thanks! Yep, thanks from me too. My eight year old son loves snap circuits and I can tell he's ready to move onto something more. Would Lego mind storms be a good next step?